The sun finally decided to shine over Paris, after many rainy and dark days, and so it was the perfect Sunday afternoon to spend....indoors? Well, with the opportunity to spend a few hours under this particular roof, which I had not ever done, I wasn't going to pass up that chance. 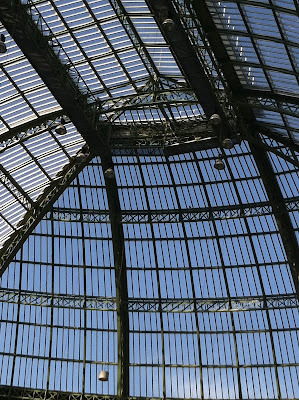 FIAC, the International Contemporary Art Fair held in Paris each fall, is something to see, at least once, even if you're never going to be reaching into your stock portfolio to buy one of the thousands of works here. 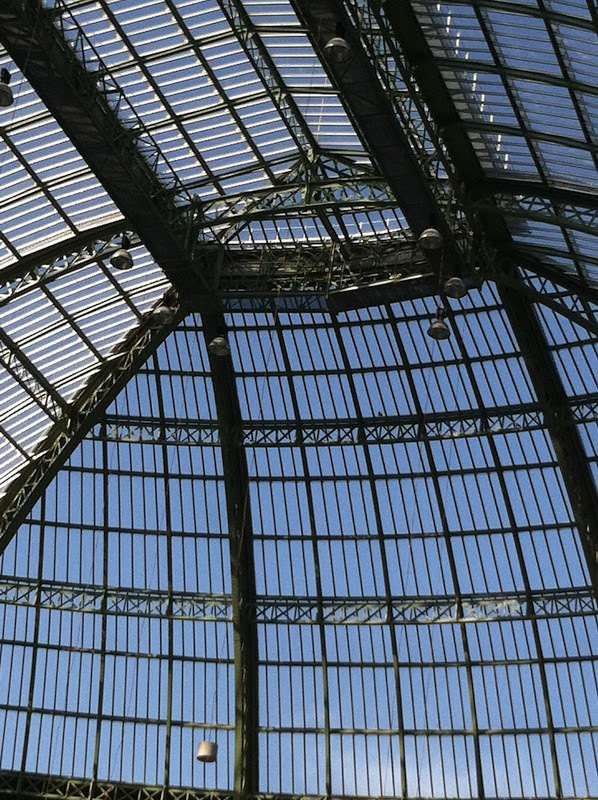 And it's held under the incredible glass dome of the Grand Palais, created in 1900. With the sunlight streaming brightly down upon works ranging in value from 3,500 euros up to practically priceless, it got a bit steamy in there. And during the four hours on my feet and nowhere to sit but for a few well-placed "bars" (thank goodness) with thousands of other mostly collector-wannabees like myself, it got to be a bit overwhelming. Nonetheless, I thought was well worth the effort, energy expended and cost (not cheap - 60 euros for admission and enormous catalogue!). Note to self if I ever do this again - wear flats with more arch support, and be sure to not pick up the catalogue until I exit the fair. So, if you're not a millionaire contemporary art collector and not likely to ever get to experience this iconic event, here are a few photos and a New York Times article that provides more detail on some of the facts, figures and art on view during this four-day truly international événement.